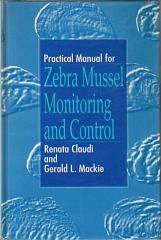 The book presents a "fast-track" approach for handling current zebra mussel problems as well as a "slow-track" approach for avoiding potential problems. No other book offers so much information designed to help you avoid excessive down-time due to macrofouling. If you are an engineer, technician, or operator at a power utility, industry, or water/wastewater treatment plant, this manual is a "must-have" book. Alien species invade aquatic ecosystems through both intentional and accidental means. The voluntary introduction, if performed at all, is usually monitored by professionals who have made a risk assessment. Accidental incursion is more difficult to control and poses a potentially grave threat if left unchecked or undetected. Nonindigenous Fresh Water Organisms focuses on this infringement in North American aquatic ecosystems. The 31 chapters measure the devastating ecological, and sometimes economic, impact caused by the encroachment of immigrant species. The book includes case studies such as the Zebra mussel, which arrived in the Laurentian Great Lakes via the ballast of a foreign ship. There is a section for each pathway of introduction, which includes a chapter devoted to its North American history and an analysis of the potential harm caused by further intrusion. The final portion of the book is devoted to a prediction methodology for the success or failure of an introduction. The chapter on risk assessment is especially useful for the planning of a voluntary introduction. Invasive alien species are a recognized global threat to biodiversity, and their costs to agricultures, forestry, fisheries, and public health are thought to be enormous. No comprehensive overview exists of the invasive alien species issue in Canada. Alien Invaders in Canada's Waters, Wetlands, and Forests aims to bridge this gap. It is a collection of papers from experts in several disciplines who discuss and analyze invasive species from a variety of perspecives: invasion pathways, affected sectors, management and control, and national and international collaborations. 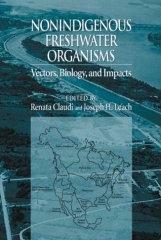 Renata Claudi, MSc, an acknowledged expert on macrofouling and aquatic nuisance species, spearheaded the development of the publication. Patrick Nantel, PhD, is a Canadian Forest Service science advisor and plant ecologist. Elizabeth Muckle-Jeffs is a communications expert and associate of The Professional Edge. 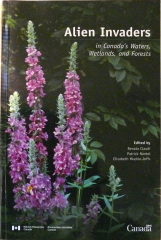 Upon its initial publication more than fifteen years ago, this book broke new ground with its comprehensive coverage of the biology and ecology, distribution and dispersal mechanisms, physiology, monitoring, negative and positive impacts, and control of aquatic invasive species of mussels, clams, and snails. 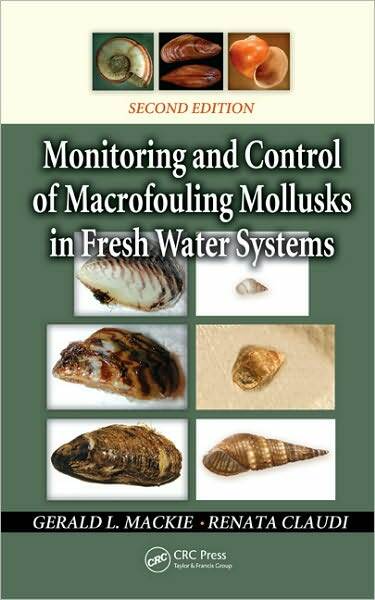 Building on this foundation, the second edition of Monitoring and Control of Macrofouling Mollusks in Fresh Water Systems includes completely revised information on species such as the zebra mussel while also covering up-and-coming nuisance species such as the quagga mussel, Conrad's false mussel, the Asian clam, and the fast-spreading golden mussel. The book contains brief descriptions of the external and internal structures, examining only those features relevant to the monitoring and control of the invasive species. It discusses why the mollusks are pests, distinguishing nuisance species from native species, their habits and habitat, reproductive potential, and life cycles and population dynamics. The authors also explain how efficient dispersal mechanisms employed by the nuisance mollusks not only help them spread so rapidly to inland lakes and rivers across continents, but how they can invade virtually every part of a facility. While many other resources contain segments of this information, none cover all areas and link them in a cohesive fashion. It is this approach that makes the understanding of potential impacts on ecosystems, industries and utilities, as well as the many human-made physical and chemical mitigants for controlling the mollusks supplied by this book so crucial for preserving the health of raw water supplies.